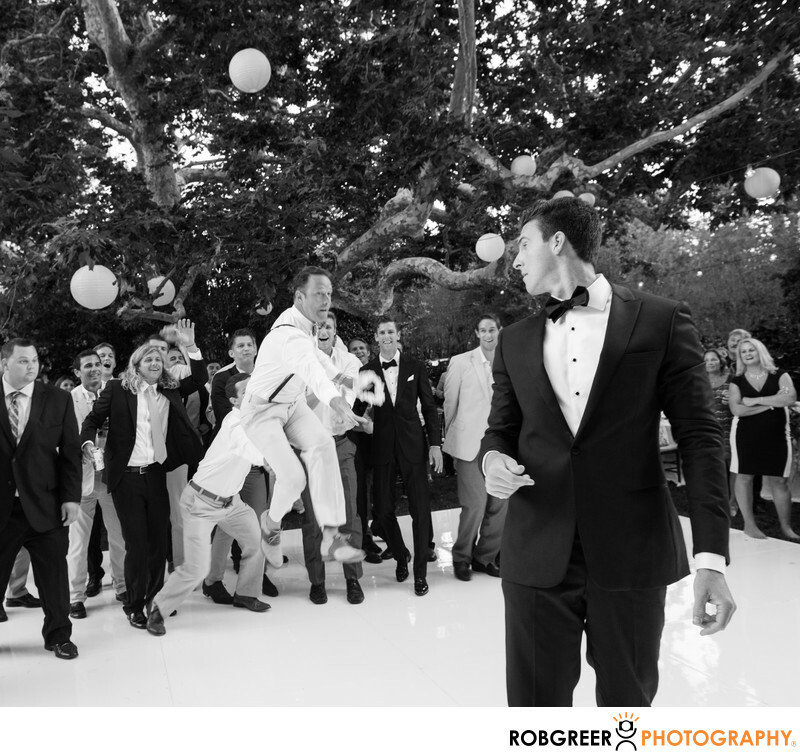 For this Malibu reception, timing became the main consideration during this garter toss. After the wedding when I was designing the album for this couple, they had a good chuckle about this image. Apparently the guy who is catching the garter after a midair leap is somewhat height challenged, but that didn't stop him from making an aggressive move and ending up with a garter. Whenever I'm photographing a bouquet toss or a garter toss my goal is to capture an image that includes the person throwing the item, the item in midair, and the person about to catch the item. That's an incredibly difficult task when you're also faced with all of the many things that can go wrong to prevent that kind of photograph from happening. Sometimes the DJ can move things along too quickly while in other cases the throw for the item isn't very high or very far. Or sometimes the throw is very quick. But even with those challenges, I'm proud to say that in most cases I will always capture the action of the throw, the fly, and the catch (although I can never provide any firm guarantee). This wedding was photographed at a private estate in Malibu, California. 1/100; f/5.6; ISO 800; 24.0 mm.